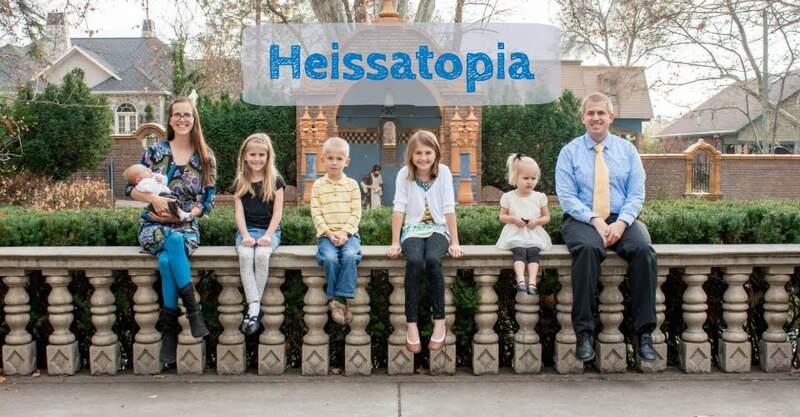 Heissatopia: Can a woman forget her sucking child? The answer is yes. At least for a little while. On Thursday I did Rachel's class party and then cleaned up from the party and loaded all of the children and all of our supplies into the van: that's four children, a stroller, a diaper bag, two big bags of supplies, two backpacks, two big coats (because the mornings are "so cold" but the afternoons aren't), and maybe some other stuff that I can't remember. The trunk was pretty full. Zoë fell asleep on the way home, which was a good, good thing because aside from a twenty minute catnap in the teacher prep room she hadn't slept the whole day. When we pulled into the driveway I told the children they could do the things that they had to do before coming back to help me. Some had to go potty so couldn't help carry stuff. Others had to carry in a single sheet of Very Important Paper so couldn't help carry stuff. You know—important stuff! Everyone but Benjamin forgot to come back out to help me carry things. I checked the mail and grabbed a few things and took them into the house, exasperatedly mentioning "How nice all the help was!" The girls were like, "Oh, yeah! I forgot! Just let me find my shoes!" While they were "finding their shoes" (c'mon—you just walked inside and kicked them off in the entryway so they were right there the whole time) Benjamin and I finished carrying stuff in. I closed the trunk and locked the van. Miriam held the door open for me and my load of stuff. "Is that everything?" she asked. "Okay," she said, looking around the house in confusion. "So...what about the baby?" "Oh, no!" I gasped. "I forgot about her!" Nothing bad happened to her. The solution was as simple as unlocking the van and retrieving her. And I'm sure I would have realized she was missing on my own...eventually. But that is just how easy it is to forget about your baby. I'm lucky my memory lapse was only in my driveway, on a temperate (albeit drizzly) day, thirty seconds after I locked the van and walked away. One little change in your routine really can make you forget your baby. Usually I put the diaper bag (with my purse and phone and keys) on the floor under her carseat. But I didn't because I had all that other stuff so I put it in the trunk. Usually I have to unbuckle Benjamin and then immediately run around to unbuckle Zoë. But I didn't because his sisters unbuckled him; I stood by barking instructions as my circus clowns piled out of the van all on their own and then opened the trunk to get my keys...and all of that stuff. It is so easy to forget. I have such sympathy for mothers who've forgotten under worse circumstances (such as for a half hour on a blazing hot day rather than thirty seconds on a fine day) or under the gaze of unforgiving, judgemental monsters who jump at the chance to charge slightly-frazzled mothers with child endangerment even when their child was just fine (rather than that of my own ever-forgiving, sweet little monsters who are willing to giggle about silly mommy who forgot to unload the baby). I'd link to specific stories, but I'm sure you've seen the ones I'm talking about...or similar ones. Maybe you have a story of your own. If you do, tell it to me to make me feel better about myself. I'll be nothing but sympathetic. I never forgot a child but we've lost a child 5 times. My kids like to wander. Luckily they were always found without any harm, but raising kids is not for the faint of heart! I've never forgotten a child in a car, mostly because I didn't have one until my youngest was about 3. But one Saturday, I went to get something out of the car, and the 18 month old followed me out. I didn't register that she had gotten in, and went back in the house. Luckily, my subconscious mind noticed that she was missing and reminded me of where she was fairly quickly. I've also forgotten that my kids or neighbor kids were in the house. That's made for some fun times. There was that time when Lisa T. left her baby (Anthony) in the car with the car locked and running and I was all like "What an idiot!" until the day that I left Patrick in the car with the car locked and running. AARGH!!!! I really liked the example that is in Creativity Inc by Ed Catmull. Both parents worked for him. They had a super important deadline for a film project, so Mom went in to work early. Dad was supposed to take baby to daycare (usually mom's job) but he was so consumed about thinking about work (important deadline!) so he forgot her had baby with him. A couple of hours later, Mom sticks her head in dad's office and asked "How did it go taking baby to daycare?" Dad about flipped!!! Baby was fine--it was a wake-up call to Ed Catmull that they NEVER should have deadlines that are so important that they mess with the minds and lives of the employees. Well. He told the story much better than I did--read the book for the good version of the story. Also, I "lost" Nancy herself in the church one Sunday. I laid her down to sleep while the primary was in the chapel, left her laying there sleeping while running around doing primary stuff, and forgot where she was. We left 3-year-old Magdalena in the car after church one time, but only for a few minutes. It's always a change in routine that seems to spark these kinds of incidents - as you said, usually putting the diaper bag there but didn't, usually unbuckling Benjamin but didn't, etc. I've heard so many horror stories that I double- and triple-check myself sometimes to make sure I didn't forget someone somewhere!